Beautifully decorated 100 sqft treatment room available for a practitioner needing privacy, space for a table / bed and desk. Ideal for professionals such as RMTs, Chiropractors, Physiotherapists etc. Conveniently located along the Broadway corridor for you and your clients. Rates include the reception team welcoming/receiving patients (if you have forms you need them to fill out, we can facilitate the greeting and quick orientation process). It’s about community and coming together to benefit the client. 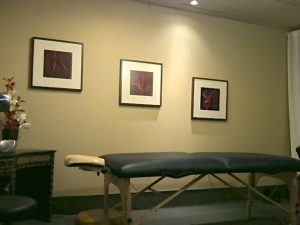 Work closely with our team of kinesiologists and therapists. Rent from one day a week, up to six. Possibility of full time rental with yearly lease. Namaste – we look forward to hearing from you!